UPDATE: As of Tuesday morning, Google Transit directions are available at www.google.com/transit or www.metrostlouis.org. The first phase in Metro’s Restoration 2010 began today with additional or new service being offered on MetroLink and Missouri MetroBus (see a previous post for complete listing of route and schedule changes). Phase 1 focuses on increasing rush-hour MetroLink train frequency by 25 percent and restoring, expanding or restructuring 20 bus routes. Bus route changes include the return of the Forest Park Shuttle and changes in the #99 Downtown Trolley to serve more locations, including City Museum. The increased rush-hour frequency on MetroLink means trains every 12 minutes on the Red Line and Blue Line and every 6 minutes between the Forest Park-DeBaliviere and Fairview Heights MetroLink Stations. The second phase of Restoration is scheduled for August 30, 2010. As of the writing of this post, Google Transit is not working properly after restoration changes took effect. Please plan your trip using TripFinder (also linked from www.metrostlouis.org). We will post an update on the blog, main website, Facebook and Twitter when Google Transit information is updated and available. Hi Courtney — in regards to the 99 “trolley”, could you clarify what this is, or maybe point me to a link that explains it? Is it labeled a “trolley” because Metro bought buses that _look_ like a trolley? Why is it called a trolley? Is it just a normal bus that has been given a trolley name because of the way it runs? The 99 was the “old” Downtown Circulator, as far as I recall. The Downtown Trolley is the #99 Circulator, except that the route has been changed to include Washington to City Museum and Market Street. The “Trolley” is a normal 30-ft bus, but Downtown Partnership is paying for a wrap design that looks like a trolley, and it will have special signage and pricing (unless you have a pass or transfer, of course). I think the trolley name was adopted to entice riders as part of the experience. Hey Courtney! I heard from someone at the Ballas Transit Center today stated that we ARE getting a trolley bus, just like the ones in Eureka Springs, Ark. I saw the route map that the line goes counter clockwise. and you stated that the route is going clockwise when I was talking with you on Facebook. If the map and the turning directions are wrong, then they need to be corrected. Please refers to my previous comments in response to Metro’s update columns dated June 28th and June 24th. Why is Metro continuing to use these so-called trolleys which replaced the bus lines, which were cut east of Tucker Blvd., when Prop. M was defeated? Part of the deal with the passage of Prop. A, was to restore these lines affected by the service cuts. Is Metro working to restore the bus lines which ran east of Tucker Blvd. previous to the service cuts? 1). The Downtown Trolley is not a trolley bus, but a 30-ft MetroBus with a special wrap sponsored by Partnership for Downtown St. Louis. 2). We have noticed the discrepancies between the #99 route map and actual turning directions and it is being corrected. 3). Thanks for your feedback on downtown bus routes. I will pass along to Planning, who are still looking at changes for the August 30 restoration. The #99 Downtown Trolley does run counterclockwise around the City Museum, finalized by the Planning Department. Why? Because a bus running clockwise from 16th to 14th street hits a sharp turn onto Delmar that cause buses to jump the curb, and is a blind turn where school buses often park. For safety reasons, the route then runs up 14th to 16th street. The wrapped buses will be running their downtown route starting tomorrow July 1. Thanks for all the great questions on new service! Thank you for the clarification, Courtney. I have to say, I am disappointed at the decision to do this by Metro. I understand the reason to want a specific branding, but this strikes me as a hokey gimmick – you are looking to attract people to a “trolley” that is ANYTHING BUT a trolley. Metro is banking on people who envision the “look and feel notsalgia” of a real trolley to ride where they might not now. There are plenty of ways to have a branded service without resorting to this. It also feels a little Sesame Street-ish, almost as if the city can’t take itself seriously. Metro seems designed to use the $75,000,000 inn new funding to co ntinue running a scaled-back, small-time transit system. I would be interested to see a breakdown on how much of this money is being applied towards more enhanced bus service, and how the rest of the new funding is being allocated. I would be interested to see how the $75M is being spent as well. Part of the issue, I think, is that Metro sees its primary mission NOT as transport, but economic development. I don’t know for sure (I am sure Courtney and/or Jennifer could find out) but I suspect that is part of what drove the creation of this “trolley.” I also suspect that very few folks outside of the people that read this blog/Facebook/Twitter know that fact. For my part, one of the things I do not like about it is that I see it as “bait and switch.” You’ll notice, Metro now calls the #99 the “#99 Downtown Trolley.” If you look back at some of the postings recently, it took some of the regular readers here a while to figure out that the #99 was not in fact a trolley or trolley bus, but a normal Metro bus that had been “wrapped.” How many people coming in from out of town are really going to know the “#99 Downtown Trolley” is really just a decorated bus? Very few, I suspect. I would almost bet money that any promotional advertising done outside the St. Louis metro area (or inside it, for that matter) won’t point that fact out, either. Metro knows that there is a nostalgic, almost emotional feel that is attached to trolleys – it draws people to them. In fact, they are counting on that feeling to help generate ridership. They wouldn’t be calling it the “#99 Downtown Trolley” otherwise. So, Metro knows people like trolleys, but either can’t (due to money) or won’t (due to money or politics or both) put one in. Hey, come ride our trolley! Oh, sorry, its really a bus — what? Bait and switch. How is this $75M being spent again? Another thing that bothers me about this “trolley” is that it looks childish, and not part of a professional transit system, PARTICULARLY as Metro seems to want to push this service. I realize that many folks may think the buses look great – I don’t. I think it looks like a cheap toy. It might serve as a “cute” Metro advertisement somewhere, but that is about it in my book. 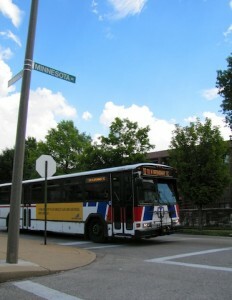 The “trolley” will get special signage that is different than normal Metrobus signage. That is not a bad thing, quite the opposite, but before we start hawking this made-up “trolley”, how about we make the system we have in place a bit more user-friendly. Signage on our current system is horrible. How is this $75M being spent again? If Metro is focusing on economic development (transit to help tourists, at least partially in this case) then they need to design transit that people WANT to take. Does Metro honestly believe that people are going to ride the #99 just because they made it a “trolley?” If they do ride it, I suspect part of the reason will be NOT because of the cutesy wrap, but because you can actually walk up to a bus (sorry, “trolley”) stop and FIGURE OUT WHERE IT GOES FROM THE SIGN! Wow. It looks like I got carried away a bit. I apologize for the rant, it wasn’t my intention when I started. Yes, I too would be interested to see how the $75M is being spent. mike, psychis are a bunch of dirtbags. I was at the North Hanley Station and saw the letter “S” next to the Saturday times for the #49 North Lindbergh and the indication at the bottom of time table stating that the bus goes to South County Center only. And I assume that meant that the line continues past the Ballas Transit Center on those selected runs. If it doesn’t, then someone needs to go and reprint the timetables for Saturdays so that the TRUTH is on the timetables. Not a bunch of lies.